Incoming freshmen interested in either a Business Education major or the Information Design and End-User Computing major may be eligible for participation in the prestigious Networks Scholarship Program. 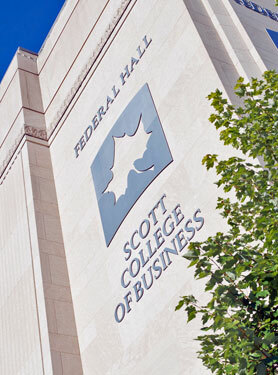 In addition to our BEIT scholarship (see below), Business Education and Information Design and End-User Computing majors are also eligible to apply for a variety of Scott College of Business scholarships. To apply for a BEIT Scholarship(s), carefully read the descriptions of each of the BEIT scholarships below to see which one(s) you are eligible to apply for. Click on the link below and complete two copies of the application form - one copy to be turned in with your transcripts (official) and one copy for your records. Hand in one copy to Dr. William Wilhelm or Dr. Chia-An Chao. Preparation for a career as a secretary or an office manager (2-year or 4-year program). Secretarial skill potential common to standards of professional excellence. Evidence of outstanding academic performance. Although recipient(s) will be selected annually, committee may choose to renew award for a previous recipient. This award shall be given to a person of sophomore or higher classification majoring in the area of office or secretarial administration (including the two-year program) or business education and who has an overall cumulative scholastic index of at least 2.75 and an index in the major of 3.0 or higher. The individual is to be one who sets high ethical, scholastic, personal, and professional standards for himself or herself and strives to achieve them. Excellent academic achievement in the field of major studies. Good personality and human relation skills. Active membership and leadership in activities which would enhance teaching capabilities. Commitment to business teacher education. A deserving student majoring in Business Education. you have the opportunity to get related work experience by applying for the Work Scholarship Program for Office Personnel. Participants gain relevant office work experience and help pay for their college education at the same time. The benefits of this program would be available to you until you complete your undergraduate program as long as your work and your grades are satisfactory and you continue to major in business education or office administrative systems. Participants graduate not only with a college degree but also with related work experience. This experience will be helpful when you are competing for your first full-time secretarial, office supervisory, or teaching position. The starting salary is $300 a month and would be paid for 9 months, and you would earn $2,700 a year. In addition, $550 of the academic fee is waived each semester, and up to $1,200 of out-of-state fees, if applicable, are waived for both options. Participants work 15 hours a week when classes are in session and carry 15-16 semester hours of classes each semester. Participants do not work during school vacations such as Thanksgiving, winter recess, and spring break. For current BEIT students, contact a BEIT faculty member.